Geothermal heat pumps are among the most efficient and comfortable HVAC technologies currently available. They can provide energy savings of up to 70% more than traditional furnaces and air conditioners! Geothermal heating and cooling has been used for decades, and with the latest technological advancements, it’s better than ever! Ernst Heating & Cooling was one of the early adopters of these HVAC systems, meaning we have years of experience providing homeowners in Hamel, Edwardsville, Maryville, and the Metro East area with geothermal heat pump services. If you’re in Metro East Illinois contact call Ernst Heating & Cooling at (618) 887-6093 today or contact us online today! 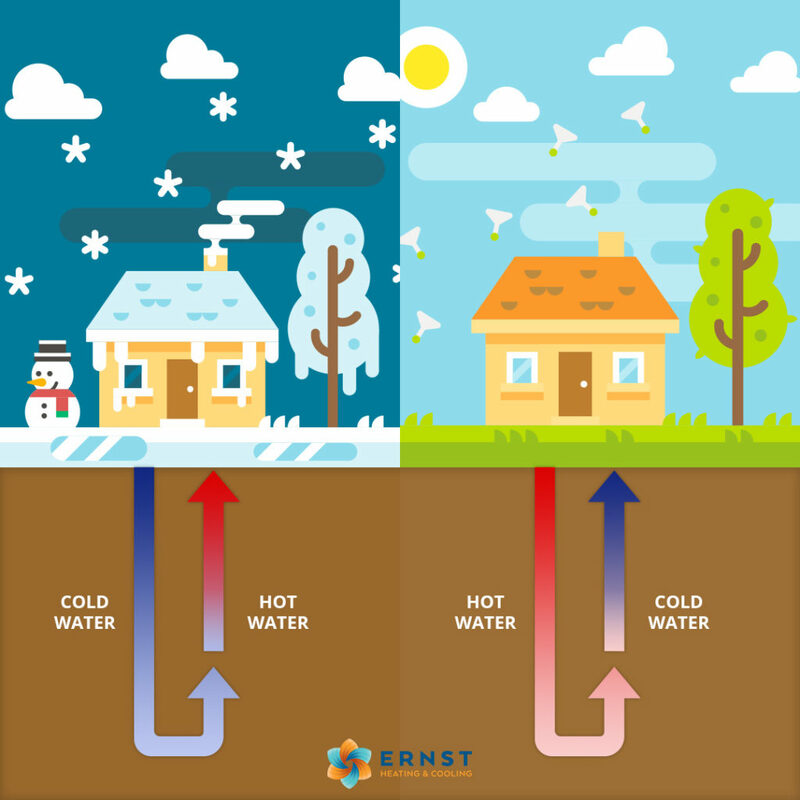 Geothermal heating and cooling works by harnessing the energy from the heat produced beneath the earth’s crust— meaning it works unlike any other HVAC system you’ve known before! Electric ground-source heat pumps are connected to an underground loop to collect heat trapped in the earth and use it to both heat and cool homes and other buildings. During the cold Metro East Illinois winter, the heat pumps pull heat from the ground and direct it into the building. In the summer, the heat pumps take heat from the building to cool it down. If you’re ready to reduce your monthly costs AND increase the efficiency of your home’s HVAC system, Ernst Heating & Cooling has a solution—install a GeoComfort geothermal heat pump! These reliable HVAC systems will keep you and your family comfortable no matter what the weather in the Metro East region is doing. These systems are perfect for areas with moderate climates, such as Hamel, Glen Carbon, Edwardsville, Maryville, and throughout the Metro East. Safety – Geothermal systems don’t require open flames or flammable material, and all outdoor components are completely underground. Convenience – One ground source heat pump can supply your heating, cooling, and water heating. The indoor units usually take up no more space than a traditional HVAC unit. Low maintenance – A geothermal heat pump has fewer moving parts and is protected from the wear and tear of outdoor elements like rain, snow, ice, and extreme temperatures, so it requires minimal maintenance. Performance – Geothermal heating and cooling will keep your home warmer in the winter. The heat pumps are extremely durable, and most manufacturers offer a warranty of up to 50 years for the system’s underground pipe. Comfort – Not only will a geothermal HVAC system help eliminate “cold spots” in your home, but will do so while being quiet! Unlike other heating systems, a heat pump doesn’t have a noisy outdoor unit that will disrupt the peacefulness of your outdoor property. The indoor unit’s noise is comparable to a refrigerator. Money savings – Although installing a geothermal heating and cooling system requires an initial investment, you will benefit from significantly lower operating and maintenance costs for the life of the system! Most of your investment can be recouped in as quickly as three years, and you may be eligible for a federal tax credit or a utility company rebate. Ready to install a geothermal heat pump? If you’re in Hamel, Glen Carbon, Greenville, Edwardsville, Maryville, or surrounding areas, contact Ernst Heating & Cooling! Geothermal systems are known for their reliability, but these efficiency powerhouses can have occasional problems. When your geothermal heat pump needs repair, the experts at Ernst Heating & Cooling will be there to help! Call (618) 887-6093 now to schedule an appointment or read more about geothermal heat pump repair. Most geothermal heat pump problems are caused by leaks, disconnected wires, defective valves, broken heat exchangers, or malfunctioning loop systems. For these or other issues requiring geothermal heat pump repair in the Madison County area, call Ernst Heating & Cooling at (618) 887-6093 or contact us online. Your heat pump works hard all year to keep your home comfortable, so making sure it receives maintenance and tune-ups every regularly is a must. Heat pump maintenance can help your system run at peak efficiency which reduces your overall energy costs. Maintenance can also help lengthen the life of your heat pump system so it can work properly for years to come! Learn more about our geothermal heat pump maintenance service or call us today at (618) 887-6093 for more information! Why Choose Ernst for Geothermal Heat Pump Services? For decades, Ernst Heating & Cooling has been helping residents in Hamel, Greenville, Edwardsville, Maryville, and beyond with their heating and cooling needs. Having extensive experience with heat pumps in the area, we’re the experts you can trust for geothermal heat pump installation, repair or maintenance. Contact Ernst Heating & Cooling online or by calling us at (618) 887-6093 to schedule your GeoComfort geothermal heat pump services in Edwardsville, Glen Carbon, Highland, Greenville, Maryville, and beyond! Alhambra, Alton, Belleville, Benld, Bethalto, Brighton, Bunker Hill, Caseyville, Collinsville, Cottage Hills, Dorchester, Dorsey, Dow, Eagarville, East Alton, Edwardsville, Gillespie, Glen Carbon, Godfrey, Grafton, Granite City, Greenville, Hamel, Hartford, Highland, Hillsboro, Jerseyville, Lebanon, Litchfield, Livingston, Marine, Maryville, Mitchell, Moro, Mount Olive, New Douglas, O’Fallon, Panama, Piasa, Pierron, Pocahontas, Roxana, St. Jacob, Sawyerville, Smithboro, Sorento, South Roxana, Staunton, Summerfield, Taylor Springs, Troy, Walshville, White Hall, Wilsonville, Witt, Wood River, Worden, and the surrounding areas!